Hebden Bridge is a lovely market town in West Yorkshire about 8 miles from Halifax and takes its name from the packhorse bridge over Hebden River (Hebden Water). The town lies at the confluence of the River Calder and River Hebden and forms part of the Upper Calder Valley and is known as the Pennine Centre. In the late medieval times the town developed as a river crossing and meeting point of packhorse routes from Halifax to Heptonstall, Burnley and Rochdale and its main industry was textiles. The Rochdale Canal that runs through Hebden Bridge was the first of three Pennine crossings to be completed and opened in 1804. The canal runs for 33 miles between Sowerby Bridge where it joins the Calder and Huddersfield Canal and Manchester where it joins the Ashton and Bridgewater Canal. The railway brought closure to the canal in 1937 but has now been restored and reopened to navigation in 2002. Hebden Bridge was a mill town producing wool and woollen goods until its severe decline by the end of the sixties. In the 1970’s and 1980’s the town became very popular with artists, writers, photographers, musicians, alternative practitioners, teachers, green and new age activists and wealthy yuppies all wanting to escape the cities to live a mixture of urban and rural life. In recent years Hebden Bridge has under gone a major clean up, sand blasting and revitalising the buildings etc making the town a great place to visit. There are many rights of way and within 10 to 30 minutes walk from the town you can stroll along the river side, amble through the wooded valleys or be in the heather moorland of the hills that surround this surprising little market town. 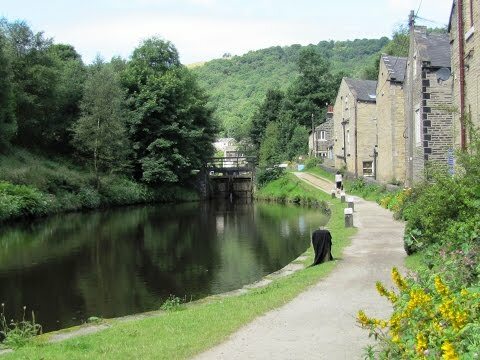 Hebden Bridge also lies close to the Pennine Way. Jumble Hole Clough is a wonderful narrow steep sided wooded valley with a small stream running into the River Calder and forms the boundary between Yorkshire and Lancashire. During the 18th and early 19th century the valley had four cotton mills and their remains and some of their mill ponds can still be seen along the fast flowing small stream as it makes its way to the River Calder. Staups Mill built in 1802 is situated at the top of Jumble Hole and was fed from a dam further upstream. It is a ruined cotton mill set in a beautiful location with a large remaining wall and waterfall behind it. With the mills occupying most of the flat land in the valleys bottoms the workers houses had to be built on the valley sides on the basis of “double decker” housing, one dwelling on top of another. Colden Clough was also once a valley alive in the cotton mill industry and several mill remains can still be seen. The valley is now a local nature reserve. There were more than 30 mills in Hebden Bridge and their tall chimneys threw out thick smoke blocking out the surrounding hills. It is said you could only see the town from the hills during Wakes Week when the mill hands had their annual holiday. We park at the side of the road (A6033) and walk downhill turning right at the White Lion pub into the town. We wander around the town centre before we walk to the end of Bridge Street and cross over the road into Holme Street and follow the road round to the left to the Rochdale Canal. We turn right and follow the tow path with the canal on our left under two bridges, past the Stubbing Wharf pub, under a railway bridge and pass through like a new age living area. We head forwards a little further and turn right through a gap immediately in front of bridge 21 through a car parking area. We pass over two bridges and turn right along the road for a short way. We turn left at the post box into Underbank Avenue, walk under the railway arch and turn left passing houses on our right and garages on our left until we come to a junction where a road comes in from the left under the viaduct. We turn right following the Pennine Bridle Way for Jack’s Bridge we pass a mill on our right and follow the beck on our left into the woods of Jumble Hole Clough. We keep following the track past a ruined mill on our right and then when the track bears round to the right we turn left crossing a bridge over the beck. As we cross the bridge we can see the remains of another mill on our right. We turn left up the track and then right on a hairpin bend going steeply uphill passing a mill pond on our right and when the track turns to the left we keep heading forwards on a path keeping the beck down below on our right. We follow the path going through a gate and uphill to a gap in the fence then head downhill to the ruins of Staups Mill. We continue forward on the path uphill to cross over a bridge and turn slightly left up some steps and cross a field to a footpath sign at a wall. We turn left staying this side of the wall to a gate in front of Hippins. We go through the gate and turn right onto the Calderdale Way going between farm buildings to cross a stile. We keep following the path to cross another stile then cross a track at Apple Tree Farm through a stile and head forwards on a stone causeway, going over stiles and passing a cottage on the right. We walk through a field to a gate in the right corner and follow the track to reach the road at Blackshaw Head. We turn right onto the road and turn left at the footpath sign through a hand gate and bear half right. We cross through fields and over stiles until we reach a yellow gated stile where we turn left down the track to a house at Shaw Bottom. We keep to the left of the house and follow the metalled track and then turn right at the footpath sign (left for the New Delight pub). When the track bears left down to a building we keep heading forwards on a stony track until we see a small marker post directing us left downhill to cross an old stone bridge. We then turn right along the stone causeway next to a wall with the wood on our right. We cross over the second stile on the left and keep following the stone causeway through fields and gates and over stiles until we come to where an unmarked track comes in from the right we turn left keeping the wall on our left to reach a tarmac track and a house. We turn right onto the track and when the track bears right we keep heading forwards to the left of the house in front of us with the wall on our left. We follow the path through a gate and past a bench until we come to a road where we head straight forwards along the road uphill. When the road bears to the left we take the footpath on the right which meanders through the wood and we scramble over a few rocks until we leave the wood and follow the wall to Hell Hole Rocks. When we reach a wall corner with a way marker post we turn right (left for Heptonstall) and follow the black way markers downhill for Hebden Bridge. At the road we turn right downhill to the main road at Hebden Bridge, turn left and make our way back to our parked car. This is a moderate to hard walk with a few steep inclines and declines and along narrow paths with steep drops. Approx 6.75 miles allow 3 hours using OS map OL21 South Pennines. Hebden Bridge is in West Yorkshire. Hebden Bridge is situated on the A646 between Halifax and Burnley. There is free road side parking in Birchcliffe Road (A6033) at the side of the river. There are car parks around the town with only a few disabled spaces and charges are variable. In Hebden Bridge there are public toilets and many shops, cafes, pubs and restaurants. At Blackshaw Head there is a pub The New Delight. Well done we enjoyed your walk around our district. We met you a few days ago on your way from Elterwater to Little Langdale and you gave us a card. We’ve also looked at several other walks. They are a credit to both of you. Thank you for your kind comments we remember you well.